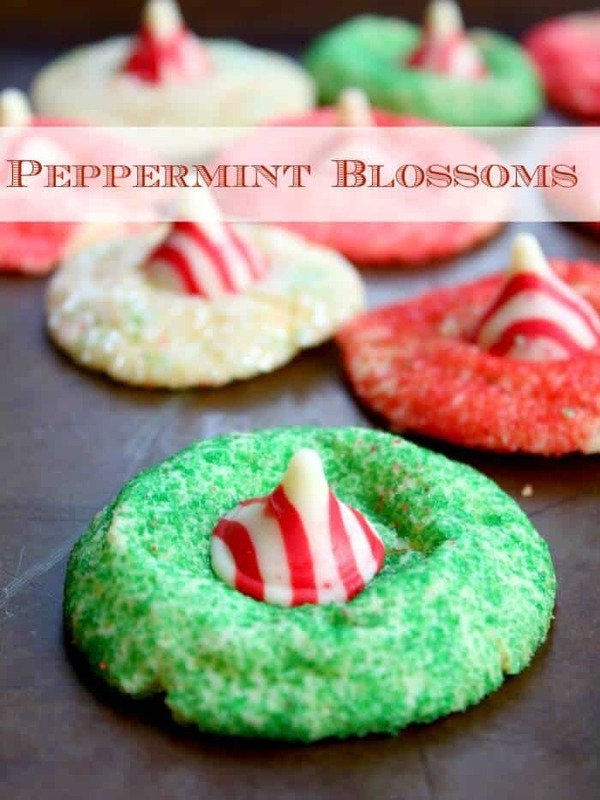 Peppermint Blossom Cookies are buttery vanilla cookies with a white chocolate peppermint kiss in the center. They are slightly crumbly, very buttery, and I have it on good authority that they are one of Santa’s favorites! I had plans to make about four different kinds of cookies this week but I think I overextended myself more than usual. 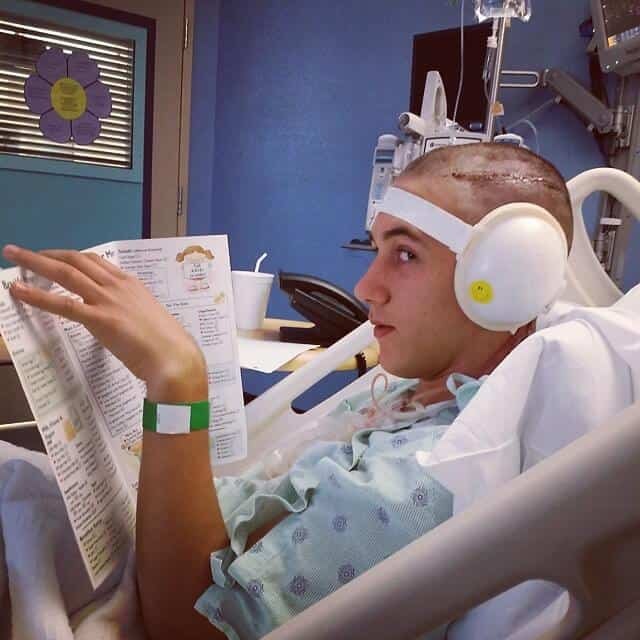 My 16 year old had surgery for a cochlear implant and ear reconstruction. I don’t know what I was thinking because for some reason I figured that I would have lots of time on my hands. So the surgery lasted five hours and he came through it better than I did. FIVE HOURS, people. I am a mom – even the nurse calling with updates didn’t spare my fingernails. He was in for three days and I think that they breathed a sigh of relief when he came home and their grocery bill dropped significantly. The nurses were bringing him four juice boxes at a time — of course part of that is it is a Children’s Hospital and he just turned 16 last week (Happy Birthday, right?). The juice boxes were obviously planned for small children. My son was born with unilateral microtia, which just means he had only one ear. He happily pointed out to me that one of the band members of KISS has the same condition. Anyway, It’s all done but the healing and were excited about it around here. My daughter took this picture of him doing what he does best — deciding what to eat. He’s a great kid, really and has maintained the A honor roll for a while. People always ask me what we did to make him so confident and not self-conscious about his condition — the lack of hearing also gave him speech problems and is in speech therapy for his Rs and not slurring his words. Anyway, I don’t know that we did anything in particular. If you have a child with microtia it’s not like it’s the end of the world. I just always told him that he was formed that way just like he has brown eyes. We always handled it matter of factly and as he got older he explained what it was if he was asked. No big. He’s a black belt in karate, has won several trophies, and rarely gets a grade below 95 so I am thinking it hasn’t held him back at all, you know? This batch of peppermint blossom cookies are flatter than I would have liked and it’s my own fault. I was hurrying to make them so my 14 year old could take them to youth on Sunday night for their party. I am also working on a book for a client and I was wrapped up in what I was doing until it was almost too late to make the cookies. Your’s won’t be as flat if you don’t hurry them like I did. I just didn’t take the time to put them in the freezer for awhile. You can roll them in colored sugar or crushed peppermint candies — they are always a hit! 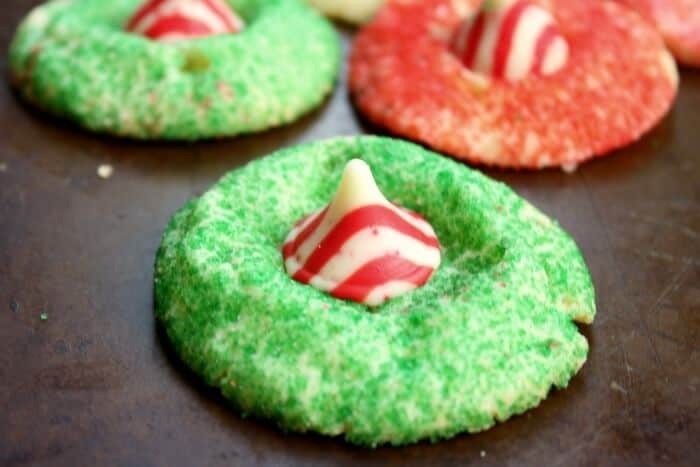 Buttery sweet cookies with a white chocolate peppermint Kiss in the middle. These are favorites for cookie trays and gifts -- and Santa loves them. Add the vanilla and the egg yolks. Stir the flour, baking soda, and salt together. Add the flour mixture to the butter mixture and blend. If it is too dry add the milk a little at a time until a firm dough is formed. Shape the dough into 1 inch balls and roll in the colored sugar. Bake for 8 to 10 minutes or until puffy and set. DO NOT overbake these. Remove from the oven and cool for 3 minutes or so. Press a Kiss into the center of each cookie. Place in the freezer for a few minutes to keep the chocolate from melting too much. Remove from the cookie sheet.